For more high-resolution photos, click here. 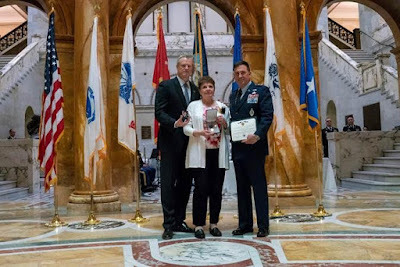 BOSTON – Today, Governor Charlie Baker was joined by Secretary of the Department of Veterans’ Services Francisco Ureña, Undersecretary Patrick McMurray, Massachusetts National Guard Adjutant Major General Gary Keefe and elected officials to present the Massachusetts Medal of Liberty to 14 families of fallen servicemembers. 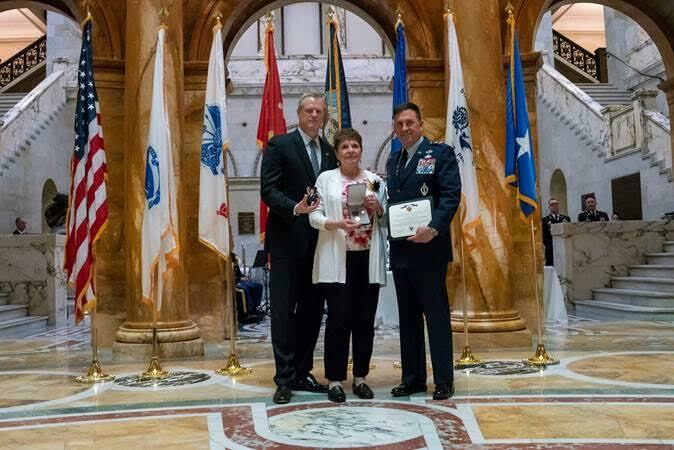 Established nearly 10 years ago by the Massachusetts Legislature in the VALOR Act of 2009, the Massachusetts Medal of Liberty is awarded to surviving family members of service men and women from the Commonwealth who were killed in action or who died in service while in a designated combat area in the line of duty or who died as a result of wounds received in action. Today’s award recipients are families whose relatives have served our nation across the globe and in multiple conflicts: World War II, Korea, Vietnam, Operation Freedom’s Sentinel, Operation Iraqi Freedom, and Operation Enduring Freedom. The recipients represent multiple services, including the U.S. Navy, U.S. Marine Corps, and U.S. Army. Ensign Charles Mantell of the U.S. Navy died in 1944 during WWII. His nephew John Crawford of Whitinsville, MA accepted the Medal of Liberty on his behalf. PFC Roland N. Baxter of the U.S. Army died in 1944 during WWII. His cousin Gilbert Bagley of Plainville, MA accepted the Medal of Liberty on his behalf. CPL John M. Dawson of the U.S. Army died in 2015 while in Afghanistan as part of Operation Freedom Sentinel. His father Michael Dawson of Whitinsville, MA accepted the Medal of Liberty on his behalf. PFC Dennis J. Conry of the U.S. Marine Corps died in 1969 while serving in Vietnam. His brother Mark Conry of Dedham, MA accepted the Medal of Liberty on his behalf. SGT Gilbert Carvalho of the U.S. Army died in 1968 while serving in Vietnam. His daughter Brenda Aguiar of Fall River, MA accepted the Medal of Liberty on his behalf. SSG John D. Casey of the U.S. Army Air Force died in 1946 during WWII. His cousin Evelyn Bon Tempo of Milford, MA accepted the Medal of Liberty on his behalf. PFC John J. Maheigan of the U.S. Army died in 1945 during WWII. His brother Edward Maheigan of Dorchester, MA accepted the Medal of Liberty on his behalf. SSG Donald H. Mann of the U.S. Army died during WWII. His granddaughter Juanita Heald of Davenport, IA accepted the Medal of Liberty on his behalf. PFC Stanley J. Kmiotek of the U.S. Army died during WWII. His nephew Stanley E. Kmiotek of Tolland, CT accepted the Medal of Liberty on his behalf. SPC Edgardo Zayas of the U.S. Army died in 2006 while in Iraq as part of Operation Iraqi Freedom. His wife Suheil Campbell of Dorchester, MA accepted the Medal of Liberty on his behalf. BM1 Brian J. Ouellette of the U.S. Navy died in 2004 while serving in Afghanistan as part of Operation Enduring Freedom. His mother Peg Ouellette of Watertown, MA accepted the Medal of Liberty on his behalf. MSG Francis H. Stamer of the U.S. Army died in 1950 while serving in North Korea. His stepdaughter Elaine Byrne of Newbury, MA accepted the Medal of Liberty on his behalf. PFC John J. Mills of the U.S. Army served in WWII and died of complications from being a POW after the war. His wife Mary Mills of Brockton, MA accepted the Medal of Liberty on his behalf. SP4 Charles J. Sabatier Jr. of the U.S. Army died in 1968 due to injuries sustained during the Vietnam War. His wife Margaret Griffin of Wellesley, MA accepted the Medal of Liberty on his behalf.